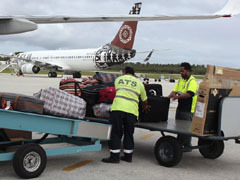 ATS Tonga directly provides full passenger services, full baggage and cargo handling services, full load control and dispatch services, and full ramp handling services for both scheduled and non-scheduled carriers. Our ground handling and ramp personnel are very well trained and qualified to support every custom flight, independent of aircraft type or number of passengers and crew. 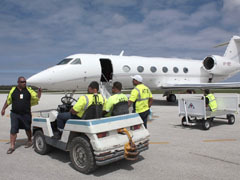 Personnel are experienced with ground handling operations on a daily basis from international airliners to inter-island domestic aircraft and general aviation. ATS Tonga has a range of equipment to suit many requirements. Equipment we have available includes stairs, tow bars, belt loaders, baggage tugs and trolleys, pushback tractors, pallet loaders, various loading machines and other miscellaneous equipment. If you have specific equipment needs please don't hesitate to contact us as we may already have it or can source it for you.